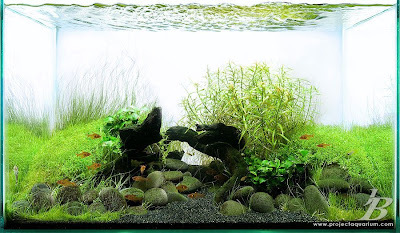 Aquascape of the Week: Jason Baliban's "Wainapanapa"
Inspired by the black sand beaches of Maui, Jason Baliban created this awesome aquascape from photos taken on his vacation. I love the "eroded hills" look here, and it perfectly matches what you'd see by the ocean. The round pebbles fit well too and add lots of visual interest. Check out more pictures including pictures of the beaches in Maui that inspired this aquascape in this thread.